As Westerners we can be quite the idiots. We have this belief system "Orientals" are inscrutable, mystical and in contact with the mysteries of the universe which elude us. So in karate we look for the "hidden secrets". When the Okinawan masters say "there are no secrets" we don't accept it, we think "Ahhh. . . they're hiding something!?" If its hidden, its hiding in plain sight. If the Okinawan Masters doesn't admit there are secrets we set out to discover them for ourselves. Worse case scenario, the Okinawans acquiesce and reveal the "secrets" i.e. make them up. Then we walk around, obi tied tight, secure in the knowledge we have received transmission of the "secrets" of Okinawan karate-do. Heck even my old (1973) promotion certificates states "This is to certify that the above named person has learned Karate-Do secrets of karate training…"
Somehow this belief in undiscovered secrets has worked it's way into our dojo training. Not only that but it has colored that training and not in a very helpful way. Take the Naihanchi katas. Most American Masters still teach the Naihanchis have no actual bunkai applications. Yet martial arts history researchers now know the Naihanchis are taken from the Chinese Niafunchin forms which do have bunkai as it was originally a Chinese grappling kata. So, are the Okinawan's hiding secrets from us in the Naihanchi katas? Or is it simply political prejudice? There is history to support the latter; when Funakoshi took the katas to Japan the Japanese felt the katas were too "Chinese" coupled with Japans complete disdain of the Okinawans as lower class citizens (the remnants of which remains today). The katas simply were not hard-core enough so, Funakoshi changed them, making the katas more acceptable to the Militaristic pre-WWII Japanese society. But still we look for, and see things that are not there. Ananku. So the kata depicts battling multiple assailants simultaneously. Bunkai everywhere and then suddenly, in the middle of the kata, we stand in a Pinan yoi stance before returning to combat. Seriously, does anyone really believe in the midst of a fight the defender would stop, stand up and wait for an attacker to regroup? I mean REALLY? Okay lets look at the name of the kata; Ananku. Developed by Kyan Chotoku, translated it can mean "Light from the South" or "Peace from the South" and probably refers to a visit he made to the island of Formosa (now Taiwan). "Peace from the South", hmmm, the Pinans mean peace. The ready position in the middle of the Ananku is the Pinan yoi position. If you were practicing Ananku on the beach of Okinawa facing inland (to ensure no one was watching your practice) you would start Ananku facing the East which would mean when you were in the kata, in this position you would be in the "Peace" stance facing South. Formosa is to the south of Okinawa. Hmmmm . . . . Homage to teachers in Formosa or maybe it was the Chinese Dim-Mak [delayed death touch] technique learned by Kyan in his travels?! Which makes more sense to you?. Let me provide a more easily to understand example. The other night I was re-visiting the Yakouski kumites. I've always disliked practicing them because they made little sense to me. We got into a discussion about the execution of techniques in the kumities. Specifically yakasuki kumitee #4. You've turned your back on an standing attacker and walk away. 3 steps later the attacker grabs your shoulder. Your turn, high block to defect the incoming head punch then simultaneously block a left low punch and deliver a right chest punch. The discussion led to, does the attacker walk directly to the side of the defender, or does the attacker adjust their steps to place themselves directly behind the defender (the traditional position). The discussion led to a decision that if the attacker lines up directly behind the defender then when the defender turns they are off-set from the attacker and in a better tactical position. This is an excellent rational. 1) At the beginning of YK4 you are walking away from an assailant who just attacked you; turning your back on them while the assailant is still well within attack range. Does that make any sense? No. 2) Knowing the attacker is behind you, when they place their hand on your shoulder, why wouldn't you do step forward and away rather than simply turning blindly to your left without looking? Does that make any sense? No. 3) When you turn, you stand there, like a log, and block. Does that make any sense? No. So given the above, why would it then make sense to change one move (i.e. the steps) because it made tactical sense when the form is rife with tactical ineptitude??? Each one of the other 6 YKs can be also, and equally, dismantled to discover the tactical ineptitude inherent in the forms. If, in the middle of a kata, an Okinawan scratches their nose, some Westerner will be certain they have spotted a "secret" signal and ascribe a bunkai application to the move. Okay I told you at the beginning I did not like the Yakusoku Kumites. Now I know why: my obtuseness. 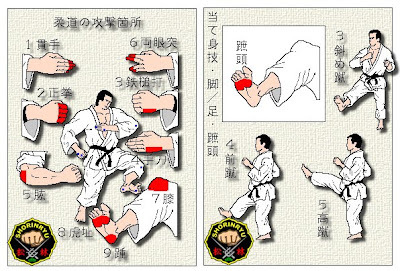 Let's look of the hidden bunkai of the Yakusoku Kumites in the name "Yakusoku Kumite" itself. Many practitioners will teach you that "Yakusoku Kumite" means "pre-arranged sparring". This is not accurate. While the Yakusoku Kumites ARE pre-arranged sparring that is not how they are translated. Yakusoku Kumite, translated, means "Promise Kumite". "Promise"? What's the promise? As a two man prearranged sparring technique, the promise is "I promise not to hurt you" as you promise me as well. Okay, now we're onto something. Who in the dojo promises not to hurt another member of the dojo? Certainly not the yudansha. As yudansha we are expected to have the degree of control necessary NOT to hurt another person in sparring unless we are engaged in Iri Kumi (knockdown kumite). Well that leaves the mudansha (we're getting closer). With a Mudansha practicing the YKs it would make perfect sense to promise not to harm each other with the technique. Now lets look at history. Osensei ALWAYS admonished great care when engaged in Jiyu Kumite (free sparring). At one point he prohibited Jiyu Kumite in his dojos as a way of avoid injury for a period. So the history is established. Now lets look at how we learn to free spar and when we start Jiyu Kumite. In most American schools once you achieve green belt you suddenly can start Jiyu Kumite. That makes no sense. How does a student learn how to control a technique? Kata does not teach it - kata only has one person. Jiyu Kumite can teach it through trial and error and blood and bruises, but not the best choice and may even account for student attrition rates. So, I believe, Osensei developed the Yakusoku Kumites specifically to fill the training gap between kata and sparring. The Yakusoku Kumites are not combat techniques, they have no bunkai applications. They are simply techniques linked together teaching the mudansha technique, control, stability and timing. That and nothing more. You take a mudansha, train them in basic kihon, mudansha katas and all 7 Yakusoku Kumites then, and only then, are they ready to ease into free sparring. NOW the Yakusoku Kumites make sense! Once the mudansha can complete the Yakusoku Kumites effectively, the ground is set for progression to Jiyu Kumite and later Iri Kumi. Yes, you can take the YKs and change them to reflect proper tactical timing, positioning and technique but you should do that with the entire Kumite not just one move and then sit back and believe you have accomplished something, you haven't, you've missed the point. So it's not about seeing bunkai where none exists but in stopping and thinking about technique AND training AND history AND what really makes sense (not what appears to make sense). As I have said before, you do not have to agree with me, heck most of you never read this far in the posting anyway (thanks for sticking it out). You may not agree with my logic but "Promise" me you'll think about it? P.S. My profound thanks to my fellow karate-ka for forcing me to think about what I thought I knew. Higaki, Gennosuke, Hidden Karate: The True Bunkai for the Heian Katas and Naihanchi, Champ Pub. Nathan Johnson, Barefoot Zen: The Shaolin Roots of Kung-Fu and Karate, Samuel Weiser Pub. Nathan Johnson, Zen Shaolin Karate, Charles Tuttle Co.
Nagamine, Shoshin, The Essence of Okinawan Karate-Do, Charles Tuttle Co.
"Fighting is not scary, looking inward at oneself is scary. The journey to mastery in the martial arts cannot be achieved without a simultaneous inward journey. The scariest opponent one faces in karate is your own ego. Success in the martial arts correlates with knowledge and acceptance of one's self."